I use a 2 TB drive for Time Machine and have used the disk for about a year or two. Today I wanted to check on an old file (an old version of MonoDevelop) and found out that my oldest backup is from January this year. I checked the disk itself and found that it really only contains folders for dates starting in January. What did Time Machine do to my old backups??? The system will delete old backups if it has an estimate that it will need the space for the impending backup. Normally the system over estimates a backup by 2 to 4 GB in routine use, but I have seen some cases where it had estimates of 250 GB or more due to some folder changes. Even without an error in estimation, you could have attached an external drive that increased this estimate drastically. Only you have the logs and data to know how plausible this is. Check out BackupLoupe if you like to have better measurements on how each backup differs in size from the others. For this reason, I periodically duplicate my Time Machine drives (or choose to rotate them monthly) so that if there is a bug, I can look when I swap in the new drive to make sure I don't lose some of my older history. bmike's answer is correct. 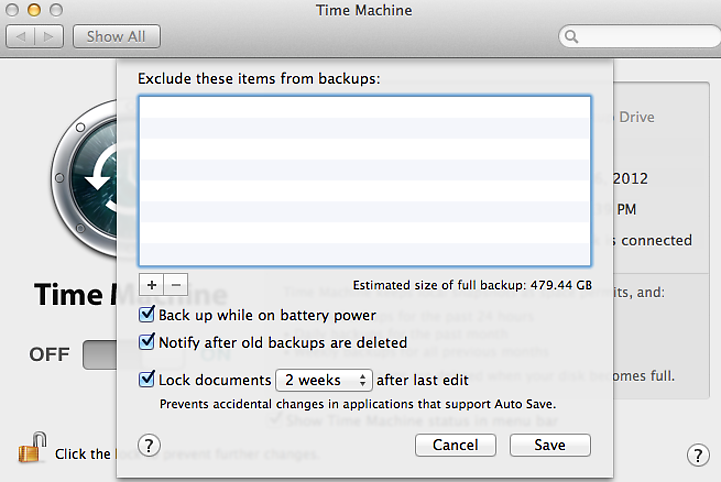 Time Machine will delete backups if there isn't enough space on your hard drive. However, he did leave out a key bit of information. There is a checkbox in System Preferences>Time Machine that tells Time Machine to notify you when it deletes old backups. IIRC, this checkbox is not checked by default, so it probably isn't on. Not the answer you're looking for? Browse other questions tagged snow-leopard time-machine . Will Time Machine delete old backups for other computers on the same drive?